The servers for Realtime Worlds' APB closed in September, but the recently updated patch notes indicate that the game may be resurrected. 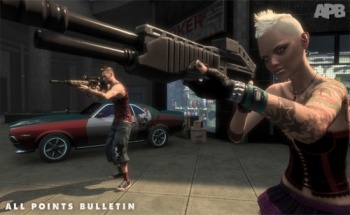 The cops and robbers MMO, APB, launched on June 29th in North America but, by August 17th, Realtime Worlds had filed for administration, a concept similar to American bankruptcy. Faced with no money to pay the bills, Realtime Worlds shut down the APB servers on September 16th. Rumors swirled that Epic Games would buy the game because cofounder and VP Mark Rein was a friend of Realtime Worlds founder Dave Jones. We hadn't heard anything for a few weeks, but the "patch notes" for the game was updated today with the first good news regarding APB that we've heard in a while. "It's looking like there might be light at the end of the tunnel for APB," the notes read. "The end of the administration process is apparently close and there appears to be a buyer for the game." That's all that we have to go on, but it seems that the APB servers may indeed get switched on at some point. All we can do is speculate as to which company is buying the game, but it may be that switching off the servers was the only option. Of the short list of six interested parties, a representative from the administration firm said that none were "comfortable with buying it as a live operation." Sometimes you have to take a step back to make a giant leap forward. In other words, maybe APB had to die before it could rise again.